Odds are your mother and/or grandmother had a sewing machine handy when you were growing up. It was a fixture of our youth, an assumption that the women in the household knew how to sew. They made dresses, costumes for parties, perhaps brought in extra money during hard times. Part of that culture grew into the drapery industry. Women, and a few men, learned how to make window treatments that complimented a carefully crafted decor. Delivering HeatSaver® Thermal Shades to your expectations is possible because of the discipline and dedication of fine people who carry on this tradition. Crafting each and every shade by hand, examining the fabrics, checking the seams, looking for flaws in order to be absolutely certain that your finished shades meet your expectations. We have shipped our shades to clients on three continents in five different countries. All with complete confidence that each and every customer is receiving exactly what they requested. That is possible thanks to the fine people we employ. Handcrafted in the U.S. specifically for you. Wherever you are. By the finest craftspeople in the industry! Window types are common within a few different styles and variations on standard themes. Window installation techniques are also fairly predictable. 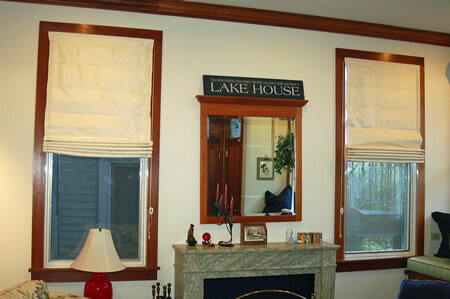 This usually equates to a straightforward installation for your shades. However there are details we have to pay attention to that are essential for your shades to operate easily and effectively. For the most part this has to do with headrail size and aligning it correctly with the track. Basically this means we need a “clean” surface minimum 1 1/4” wide left, right and above. Our Custom Examples Page shows a few examples of more complex installations, but may also give you good ideas. We will work closely with you to identify all the details pertinent to your particular needs. The measuring instructions included here will start to provide us with the information we need. This ordering notes form may also help. Initial dimensions, if only fairly accurate, are fine for estimates. Prices are not likely to change once overall dimensions are roughed in. Send us your information (digital photos are essential) and we’ll begin! So true! This one photo of a family room tells us a great deal. 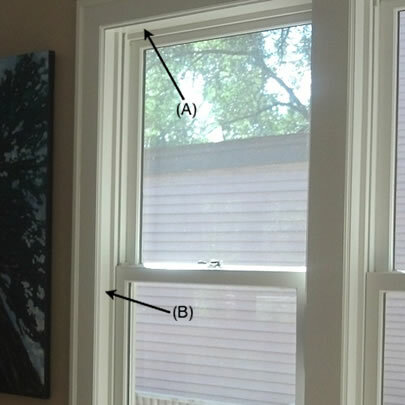 The windows are double hung with the handles easily seen, double glazed, nicely trimmed with wood casing and jambs and probably vinyl clad on the outside. Measuring and installing these will be easy and straightforward. (A) is where the headrail will go. (B) is where the track will be attached. As there is ample room the headrail will be 1 1/2” wide. Essentially we’re already down to looking at fabric colors. Off white to go with the trim or sage to match the walls? More often than not installation is easy and straightforward. By the time we’ve finalized your dimensions we’ll know what your requirements are and will have addressed them thoroughly with you. Complete installation instructions will be provided with your shades. We have expert counsel available for you should that be necessary. Standard hand tools and a battery powered drill are usually all that is required. 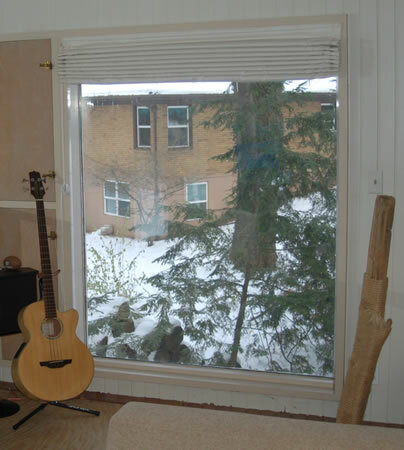 The window opening shown on the right is very much like the one above with the clean lines of wood jambs and casing. Drywall (or sheetrock, plasterboard) openings are much the same though may not be as square. Sills at the bottom are helpful but not necessary. Occasionally templates are a good idea and can help us to finalize any outstanding questions or details. Trapezoid windows are good candidates for templates. Please note: While we will work closely with you in order to ensure your shades are manufactured to your complete satisfaction, we cannot be held responsible for inaccurate measurements. Once we have all of your information in hand, have gone over it with you and finalized all details we’ll send you a completed Purchase Order for your review and approval. This also includes your 24 Month Warranty. 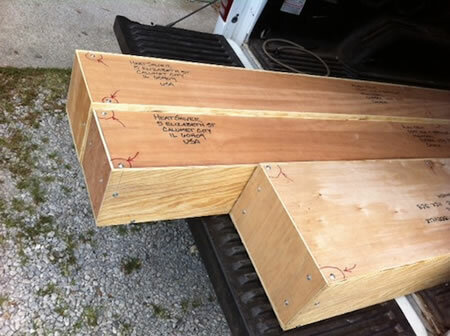 Shipping costs will vary with the size of your windows and thus determined at the time you place your order. Please don’t hesitate to call or email us if you have any questions at all. 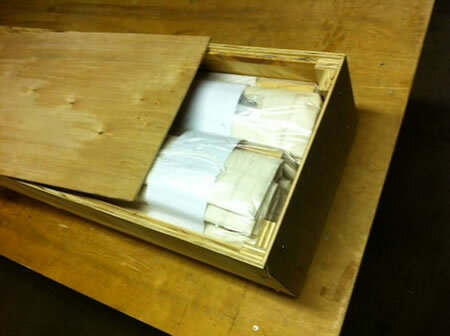 Plywood shipping cartons are built for each order ensuring that your shades arrive safely. They’re designed to be lightweight yet strong and work well for international orders as customs officials have easy access. Each one is built for each order so that no interior room is wasted and thus expenses are kept to a minimum. Even the last step in the process is customized just for you. In December of 2009 the U.S. Consumer Product Safety Commission announced a voluntary recall to the manufacturers of roller shade and roman shade products due to safety concerns for infants and small children. The Window Covering Safety Council later issued directives and suggestions to address these concerns. 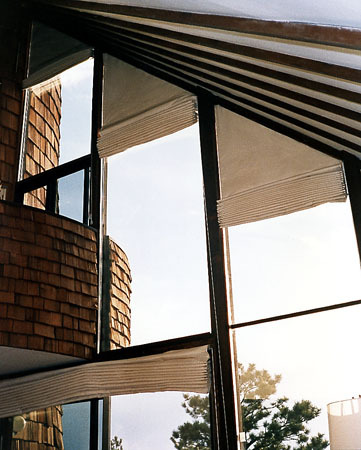 HeatSaver® Thermal Shade’s “glide in track” design virtually eliminates such hazards and we ship all of our shades with the cords braided after they leave the side opening thus minimizing any risk and meeting all requirements. Please remember – HeatSaver® is proud to support The Empowerment Plan! 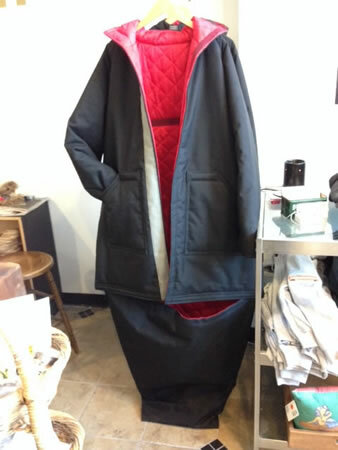 All our cutoff Thinsulate™ is being used to make coats/sleeping bags for the homeless in Detroit. Brief.